Ebooks are available through the library 24/7. You can download chapters or borrow the entire ebook. Find more information on how to search and download ebooks at the bottom of this page. There are no overdue charges; if you borrow an ebook by downloading it to an electronic device, it will be automatically returned by deleting itself! How can I download an Ebsco ebook to my computer or mobile device? 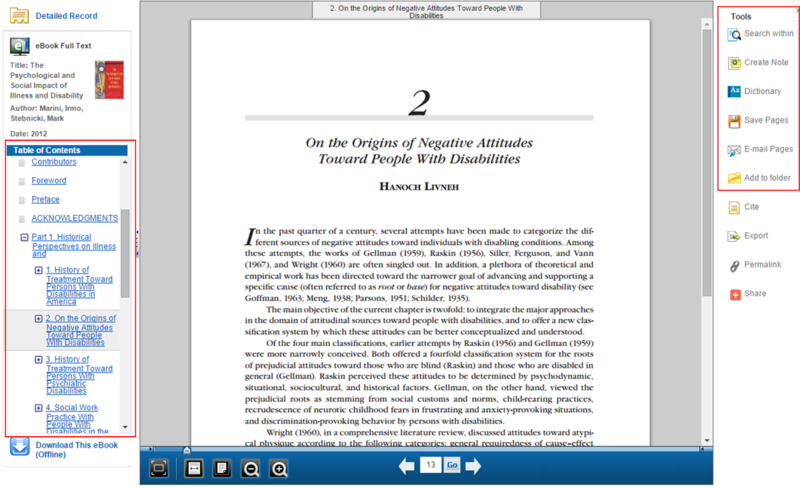 Using the Save Pages option, you can easily download one chapter or 10% of any ebook as a PDF file. Click here for more detailed instructions on searching and navigating the LLC's ebook collection. 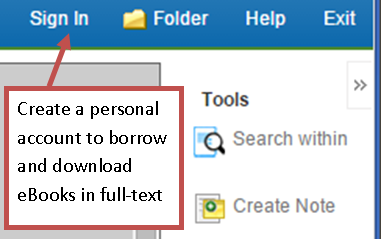 When downloading the full-text of an ebook, you are borrowing the ebook. This means you must create and sign into an account in the ebook database. Click Sign In at the top right of the screen to create an account. Similar to an email address, you choose a username and password to use as a login. For detailed instructions on how to download the full-text of an ebook after signing into your account, view this PDF help sheet or visit this web page. Chat with library staff for help. In order to download EBSCO eBooks, you must have Adobe Digital Editions 1.7.1 or higher installed on your computer. Adobe Digital Editions is a free download available here. EBSCO eBooks are compatible with all devices and apps supporting Adobe eBook DRM, a standard used by most popular eBook providers, including Google Play. A complete list of Adobe eBook DRM compatible devices and apps is available here.